The 2010 census reported that 40 percent of births happen out of wedlock. This number is even higher for Black women and other women of color. When it comes to white women, the single mother narrative is becoming increasingly positive, but increased acceptance, understanding, and support has yet to be extended to single Black mothers. In discussions on closing the racial opportunity gap, blaming systemic inequities on absent fathers and the inadequacies of present mothers continues to be deemed an acceptable viewpoint across the political spectrum. In reality, Black women are the primary breadwinners in a majority of Black households. If we truly seek to uplift Black communities, we need policies that support mothers who are present and raising their children. We need to bolster the social safety net and combat the earnings gap so that all Americans have a shot at creating a financially secure life for their family -- regardless of whether that family fits the patriarchal model deemed as the norm. Join us for a critical conversation as we explore an intersectional understanding of single motherhood. How can we expand this discourse to be inclusive? What unique challenges do single Black mothers face? How can our communities best support them? And how can we foster an intersectional conversation about single motherhood that encompasses the diverse experiences of all single mothers? 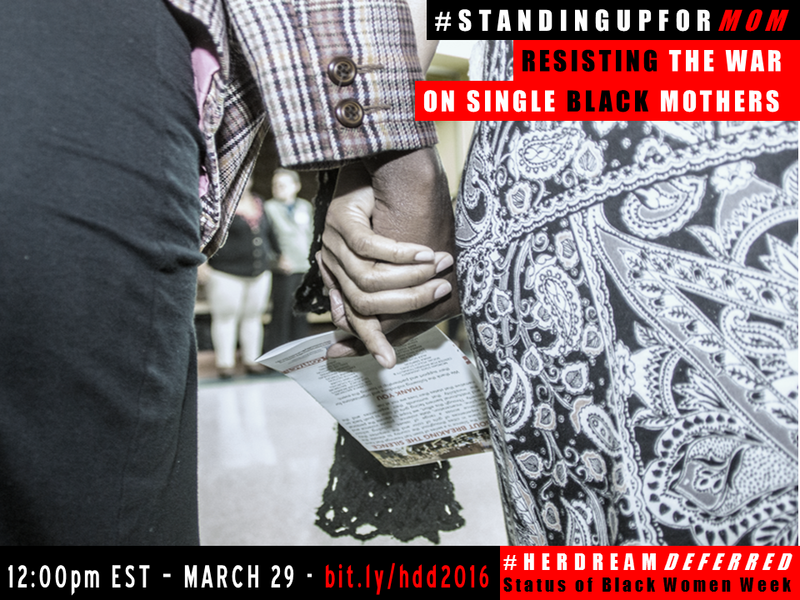 Share a photo and the story of the war on Black single mothers and resistance, using the hashtag #StandingUpForMom and #WhyWeCantWait. Does this issue resonate with you personally? Share your story of single Black motherhood or being raised by your mother to build awareness, community, and support.